I’ve been lucky enough to be out of the country for the last week, in Brisbane on training for my exciting new 9-5 job! My biggest worry was how I’d cope being away from my handsome darling for the first time in one year. Thankfully technology these days allows us to stay close to our loved ones even when we can’t be there in person. Sure, you can’t have a nice big hug or a passionate pash, but you can talk to them face to face anytime of the day or night (which when you’re on NZ time in Brissie means your normal waking time is around 4am or 5am!!). 98 Love Letters was a book I found in the library last week and reminded me of the time before mobile phones and email and all that came with them. Believe it or not this was only 20 years ago. I remember watching sci-fi tv shows when I was a kid, like Space 1999 and they would have these massive clunky telephones with tv screens attached to them where you could actually see the other person you were talking to. It seemed unreal and totally unbelievable. It was tv. Freaky, but now it’s real life – thanks Apple! Back in the day – letters were the only way to communicate without spending a fortune on overseas phone calls. I still have a whole tea chest full of old letters written by my grandparents who are no longer with me, family and friends, sent to me when I was overseas that I can’t bear to part with. But, can you even imagine the times before telephone and efficient postal systems?? Hard eh?! You would have felt so isolated and remote and every word you wanted to convey to your loved one would have been heartfelt. No txt speak or “Laters, babe”. 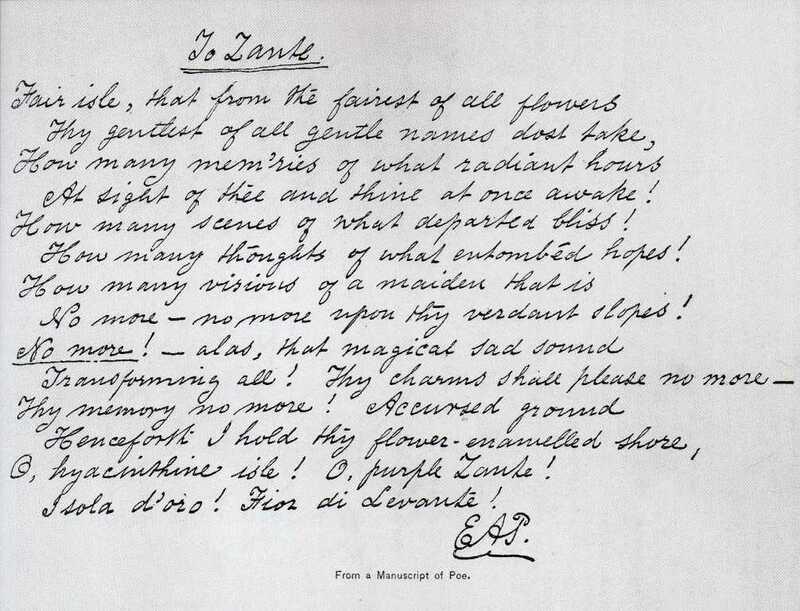 Here’s another poem from Edgar Allan Poe that was sent to Frances Sargent Osgood in 1845. According to history, even though Poe is known for his tales of mystery and macabre, the two used to exchange romantic poetry via written letter. Read more here, its an interesting story. P.P.S: absence did make my darlings heart fonder – when I came home last night he had done all these very thoughtful cute things to make me happy! !